An estimated 45 million Americans go on a diet each year, and Americans spend $33 billion each year on weight loss products. Yet, nearly two-thirds of Americans are overweight or obese. Obesity is a chronic disease that requires lifelong treatment and medical care. From self-consciousness to physical limitations, many people feel that their size is keeping them from being the person they truly are. People who are overweight are also at higher risk for developing serious health problems, such as heart disease, diabetes, high blood pressure, high cholesterol, stroke, arthritis, and gallbladder disease. Is your body weight in the healthy range? If you are unsure, use the CDC's Body Mass Index (BMI) calculator. If your weight is outside the healthy range, ask your doctor for a referral to our clinic. Our exceptional Weight Management staff is dedicated to providing comprehensive, convenient, and effective care. We provide dietary counseling, pharmacotherapy, exercise promotion, and behavior change support. Please refer to the Weight Loss Surgery website for information on the surgical treatment of obesity. Our exceptional Weight Management Program staff is dedicated to the medical and surgical management of obesity. A national leader in the field, we provide comprehensive, convenient, and effective care. We will guide and encourage you as you learn how to make lifelong changes in eating behavior, food choices, and activity levels. We can help you reach your goals through eating plans, behavioral support and exercise. We know it's not easy, but we will be with you every step of the way. Among other strategies, we believe in the efficacy of group support sessions led by a registered dietitian with experience in weight management. He/she will assist you in achieving optimal health and wellness for lifelong success. You will also have individual appointments with a nutrition physician specialist and a dietitian to address medical concerns related to diet and to help with meal planning and behavior modification techniques. Details on each diet are available in the Medical Nutrition Therapy section of our website. In some cases the dietitian or physicians at BMC will recommend a nutrition plan in combination with a medication. The Nutrition and Weight Management staff only prescribes medications that are FDA-approved. These medications can help reduce appetite or block fat absorption. They MUST be combined with one of the above eating plans or they will not be effective. Under the physician’s care, the patient will eventually stop the medication, as the FDA has not approved any weight loss medications for indefinite use. Physical activity is an important part of our weight management program. It speeds weight loss, prevents significant loss of muscle (lean body mass), and increases metabolism. More importantly, physical activity helps you maintain weight loss over time. Studies show that even a little bit of exercise makes a big difference. Our staff provides ideas and opportunities that promote daily exercise. We offer a free weekly yoga class, a walking group, and discounted gym memberships. At South End Fitness Center, you can take group exercise classes, use the strength training and cardio equipment, and swim in the Olympic-size pool. To find out what other fitness centers are offered at a lower rate to our patients, contact the clinic at 617.638.7470. Americans live in a fast-paced, high-stress, unhealthy food environment. This can set the stage for poor eating habits. When a patient enters the program, they are encouraged to record food intake daily and to participate in a weekly interactive group education session. Group classes focus on nutrition, exercise, and control of trigger situations in a supportive environment. The classes help patients build skills and a support network to lose and maintain weight. When willpower fades, as it does for nearly everyone, “skillpower” and support can lead you to success. A patient’s success also depends on regular class attendance, careful record keeping, and commitment to the program. Group sessions, which last about 1 hour, are held weekly. Have you ever grabbed an unhealthy snack when you’re feeling down? Most people who struggle with their weight eat in response to environmental and emotional triggers, even if they are not hungry. To address negative eating habits, the underlying causes must be addressed. When group support isn't sufficient, patients will be referred to a provider who specializes in the psychology of eating and weight management. The clinician helps the patient develop strategies to reduce or eliminate factors that interfere with successful weight loss. This approach increases the likelihood of long-term success. Boston Medical Center has been awarded the American Society for Metabolic and Bariatric Surgery (ASBS) Bariatric Surgery Center of Excellence designation by the Surgical Review Corporation. 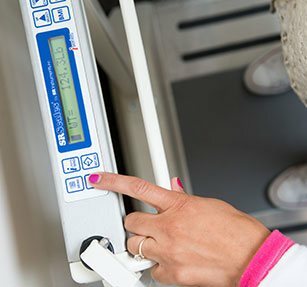 Surgical weight loss may be recommended for patients who are more than 100 pounds or 100% above their ideal body weight. In addition to the weight criteria, surgery is typically restricted to those who cannot achieve and maintain sufficient weight loss on one of our dietary programs. Prior to surgery, a weight loss of 5-10% is necessary to help reduce surgical risks. Therefore, patients will initially work with clinicians to achieve modest weight loss before being referred to the surgical team. For more information about surgical weight loss, please visit our Weight Loss Surgery website or call 617.414.8052.